Have you ever heard of bluff-to-value ratio? When understood correctly, this concept will help you make more profitable plays both as the aggressor and versus aggression. Bluff-to-value ratio is the number of bluff hand combinations vs. the number of value hand combinations in a betting range. For example, if a player’s betting range on the river contains 12 bluff combinations and 36 value combinations, then his bluff-to-value ratio is 1 to 3. The theoretically optimal bluff-to-value ratio varies by street: preflop should be your most bluff-heavy ratio and it should become more value-heavy as the hand progresses. 1. It helps you build theoretically sound betting ranges. The theoretically optimal bluff-to-value ratio is based on your opponent’s pot odds to call, which is determined by your bet size. If you get the ratio exactly correct, your betting range will be balanced and unexploitable. Keep in mind that betting with a perfectly balanced bluff-to-value ratio is nearly impossible in-game. The best you can do is estimate, trying to get as close as you can to the optimal ratio. Then, when your session is over, you can study the specific hand to see how close you were. 2. It helps you bluff-catch more profitably. Fold all bluff-catchers versus an unbalanced, value-heavy betting range. Call all bluff-catchers versus an unbalanced, bluff-heavy betting range. Note: If your bluff-catching hand can beat some of your opponent’s value range, it may be a profitable call even if his range is value-heavy. Let's run through a quick example hand that's already reached the river. Suppose a player named Mark bets $15 into a $20 pot on the river with a range of 12 bluff combinations and 36 value combinations -- a bluff-to-value ratio of 1 to 3. Versus this 75% pot bet, Susan (Mark’s opponent) is getting 2.33 to 1 on a call. Pop quiz: What is the theoretically optimal bluff-to-value ratio for Mark given his bet size? 1 to 2.33 or 1 bluff combination for every 2.33 value combinations. Since Mark’s actual betting range is too value-heavy, Susan cannot call profitably with a bluff-catcher (unless it beats some of Mark’s value range). Now, suppose Mark bet the same size on the river, but with a bluff-heavy range of 1 to 1.5 bluff-to-value. This allows Susan to profitably call with all of her bluff-catchers. Note: It's relatively easy to calculate the optimal bluff-to-value ratio on the river because your bluffs should have 0% equity when called, but this is not the case on the flop and turn. For these earlier streets, we recommend you use the rules of thumb in the next section. The mathematical explanation for this can be found in Upswing coach Ryan Fee’s favorite poker book, Applications of No-limit Hold’em, by Matthew Janda. Click below to read an excerpt from the book that explains how Matthew came up with these numbers. Beware, it involves a big block of text and math! When you bet with a theoretically optimal bluff-to-value ratio, you are not actively trying to exploit your opponent. You are only passively exploiting by giving them a chance to make a mistake versus your balanced range. Here’s an extreme example: Imagine you’re playing against a rich calling station who rarely folds any pair after the flop. If you try to remain perfectly balanced when betting, you are leaving a lot of profit on the table against this player. Instead, you should give up with your bluffs and expand your value range. Additionally, on a lot of boards you should actually bluff slightly less than the optimal ratio because of removal effects -- when you are bluffing, it’s slightly more likely he has a strong hand and vice-versa. Before we break down an example, I should say that there is more than one way to build a well-balanced flop c-betting strategy that wins. This time we’ll use the 4 Categories system taught in the Upswing Lab, which is a polarized c-betting strategy. Only the big blind calls, the flop comes K♣ T♠ 6♣. We bluff with almost all flush draws, straights draws, and backdoor flush draws. Ace-high draws are the exception, which we check back because they have a little showdown value. For value, we c-bet hands that can continue barreling for three streets on most run-outs, thus making the bottom of our value range AK. Note: We have a range advantage on this board, so we can probably get away with c-betting wider. But let’s just assume we c-bet with this tight range for the sake of the example. Our flop betting range contains 41 value combinations and 80 bluff combinations. That’s close enough to the 2 to 1 bluff-to-value ratio we aim for on the flop. Now, suppose the big blind calls and the turn is the 7♦. The big blind checks again. This card doesn’t complete many of our draws (just 98s), so we’ll need to give up with some of our bluffs from the flop to attain the 1 to 1 bluff-to-value ratio we aim for on the turn. Since QJ doesn’t block the straight and has to fold versus a check-raise, we’ll go ahead and check that one back so we aren’t forced to fold a bunch of equity. Our value range contains the same hands from the flop since the turn hasn’t drastically changed the board texture -- AK can still comfortably bet for value. Overall, we’re betting about half of our bluff combinations and all of our value combinations from the flop. So, our 2 to 1 bluff-to-value ratio is now close to the 1 to 1 ratio we are aiming for on the turn. The big blind calls and the river is the 3♠. The big blind checks. On this clean runout, we will continue barreling for value with the same range (AK+). We’ll balance this value range by bluffing with the hands that have the best blocker effects and no showdown value -- namely, Q9 and J9 without a club. Why are these our best bluffing hands? Because they block three of the strongest hands in the big blind’s range (98, KQ, KJ) without blocking the hands he will definitely fold (missed club flush draws). Overall, we are betting 47 value combinations and 18 bluff combinations on this river, which is a 1 to 2.6 bluff-to-value ratio. That’s close to the theoretically optimal 1 to 2.33 we calculated earlier (and also pretty close to the 1 to 2 rule of thumb). Now that you know what bluff-to-value ratio means, the correct ratios on each street, and what its limitations are, you can use this newly acquired knowledge to build better structures in your game that will help you as you progress through the stakes. All this being said, you should remain flexible and not be blinded by theory. Always try to find an edge! That’s all for this article. I hope you’ve enjoyed it found it useful! If you have any questions or feedback use the comment section down below. 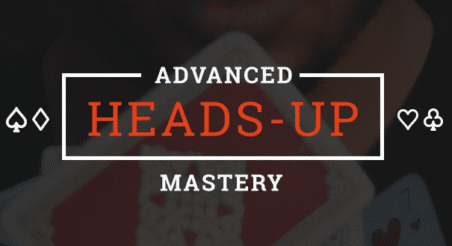 Want to Boost Your Poker Skills Without Investing Much Time or Money? ...and build a bigger bankroll.